Inositol hexanicotinate is the flush-free form of vitamin B3 critical for metabolic function. Vitamin B3, also known as niacin, serves as a critical cofactor for the breakdown and assimilation of complex carbohydrates, proteins, and fats. It also exerts positive action on blood-lipid profiles. 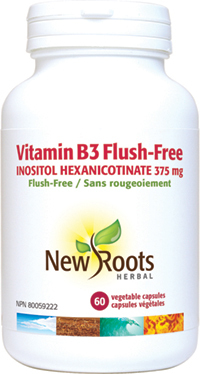 New Roots Herbal’s inositol hexanicotinate is the “flush-free” form of niacin, meaning it’s free from the sudden sensation of warmth caused by the rapid dilation of blood vessels which is a common concern with regular niacin. Supplementing with inositol hexanicotinate could prove to give that metabolic spark you’re missing in your healthy, active lifestyle. Take 1 capsule daily with a meal or as directed by your health-care practitioner.